by McGoldrick, Monica; Garcia Preto, Nydia A.; Carter, Betty A. Note: This is the bound book only and does not include access to the Enhanced Pearson eText. To order the Enhanced Pearson eText packaged with a bound book, use ISBN 0134057279. 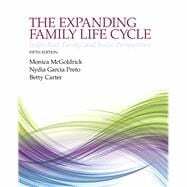 Updated, expanded, and more comprehensive than ever, this new Fifth Edition a classic family therapy resource, The Expanded Family Life Cycle, gives readers a solid understanding of human development and the life cycle. Featured are a groundbreaking integration of individual development within a systemic context discussion of the increasing racial, ethnic, and cultural diversity across the life cycle in the United States today; life cycle perspectives on LGBT issues, alcohol, sexuality, migration, social class, violence in the family, and assessment of “home place” as fundamental to clinical work. This edition moves from society’s general orientation of nuclear families to consider a more diverse and inclusive definition of society’s rapidly changing family patterns, one that considers, among other things, that the life cycle time frame itself has been expanding as people live longer and the patterns of coupling and child rearing continue to change. Also explored are the impact of issues at multiple levels of the human system and the individual, family households, extended family, community, cultural group, and the larger society. Included are new chapters on sexuality over the life curse, mental health as well as physical health in life cycle perspective, and friendship through the life cycle. The Enhanced Pearson eText features embedded self-check assessments. Monica McGoldrick, MSW, PhD (h.c.), is the Director of the Multicultural Family Institute and on the Clinical faculty of the Psychiatry at the Rutgers Robert Wood Johnson Medical School. She has an international reputation as a trainer and author. Her other books include Ethnicity and Family Therapy (3rd ed), Genograms (3rd ed), Living Beyond Loss (2nd ed), Re-Visioning Family Therapy: Race, Culture and Gender in Clinical Practice (2nd ed), Women in Families, and The Genogram Journey: Reconnecting With Your Family (2nd edition of You Can Go Home Again, 2011). She is at work on a new Genogram Casebook to be published in 2015 and has two teaching videotapes on psychotherapy.net that have become classics in the field. Nydia Garcia Preto, MSW, L.C.S.W. is the Associate Director at the Multicultural Family Institute in Highland Pk., NJ where she also has a Private Practice. Ms. Garcia Preto has been a Visiting Professor at the Rutgers Graduate School of Social Work, and was the Director of the Adolescent Day Hospital, at the University of Medicine and Dentistry of New Jersey. A noted family therapist, author, teacher, and lecturer, she has published and presented nationally on Puerto Rican and Latino families, Latinas, ethnic intermarriage, and families with adolescents. She is Co Editor of Ethnicity and Family Therapy (3rd ed), and of The Expanded Family Life Cycle (4th ed). She also is a highly respected trainer in the area of Cultural Competence. Table 12.1 Multidimensional Ecological Comparative Approach (MECA) Continuities and changes in immigrant family life cycle in cultural diversity and social justice processes. Work Tasks: Preparation Without Pay or Earning out of Necessity? Figure 23.1 Three dimensional model: illness type, time phase, family functioning.